CAGE IS NOT INCLUDED - DO NOT PURCHASE UNTIL YOU HAVE A 700 GIANT KENNEL AND HAVE MEASURED YOUR DOG. THIS KIT WILL NOT EXPAND LENGTH OR WIDTH ONLY HEIGHT. RETURNS ARE SUBJECT TO A 50% RESTOCKING/RENTAL FEE. Check with your airline for size restrictions prior to ordering. If your dog is traveling internationally the airline NOW requires for the safety of your dog a full 2-3" of extra head room above your dogs head or tip of ears (in pointy eared dogs). 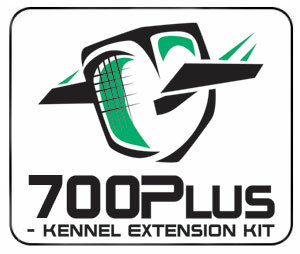 If you have an existing 700 size kennel that your dog is acclimated to and fits your dog but lacks the extra head room required, the 700Plus Kennel expansion kits are the perfect accessory. They easily modify your 700 Giant dog kennel into airline compliancy. Simply add the metal rails in between the top and bottom and install the new bigger steel door and you are all set. The kit is 100% hand installed, no tools or hardware needed or required. Simply set the two rails in between the top and bottom of the kennel. Then install the new door and thread the provided 6" bolts with metal washers through the existing kennel bolt holes and secure with the reinforced Metal Thumb Nuts (all provided in the kit). That is it... as easy as putting together the original kennel and your kennel is now taller and will now provided the extra head room required by your airline. Kit will add about 16.5 lbs to existing Giant Kennel weight after installing.